Workman Publishing Company, 9781523502035, 224pp. When change comes we have two options: Resist it, and lose. Or go with the flow, and grow. Which means there’s really just one option—embracing change is the only path to living your true life. So laugh at it, with George Carlin. Celebrate it, like Patti Smith and David Bowie. Above all, grow with it, like Maya Angelou, Stephen Hawking, Rebecca Solnit, Rumi, and so many others. Arranged alphabetically by subject—including Adapting, Control, Faith, Letting Go, New Beginnings, Surprises—CHANGE HAPPENS is the book that says: You can do this…as often as you need to hear it. Exciting. But often painful. Exhilarating, but unsettling. Clarifying. Bewildering. Unpredictable, and yet inevitable. And usually all of those things at the same time. 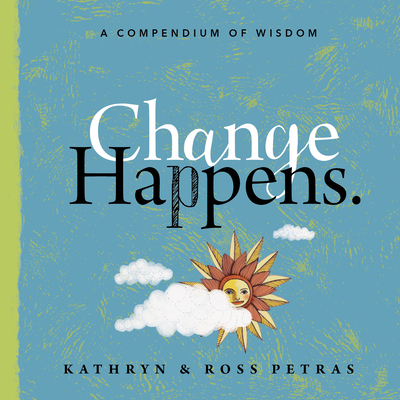 Like it or not, change happens, and when it does, here is a little book that offers true support—a collection of very wise words by very changed people who know just how you feel.